The Codex Celtarum contains a veritable host of gaming material. Built around the complete mythological cosmos of the Celts, in The Codex Celtarum, you'll find new spells for your Druid, cleric, and illusionist as well as new monsters, including mountains of fey and new magic items. For the very bold, there are new powers for your characters, allowing your characters to become fey! 150 (optional)powers for the fey monsters & characters. Druids have surmised that before the present Universe there was a Disharmonious Void that once existed. Torn by destructive chaos and strife, it was completely devoid of any creative powers and life . Nothing could exist in this Disharmonious Void. It was death for the dead in essence and completely uninspired. A spark of Inspiration or Awen, called the Great Spark, blazing red and shaped like a thunder-bolt, tore its way through the blackness with fury. The Fire of Creation split the shapeless Void into the (as yet empty) Three Circles that were anchored around one magnificent, growing oak tree. This tree was the first in the Universe, and under its immense leafy crown hung golden acorns, swollen with potency. The Druids dwelt in a world wholly apart from our own, a world that comes down to us in the stones of the cromlech, the wild burnings of the wicker man, the priests who called on ancient trees and fey to bless or defend them and a language of such haunting beauty that its echoes stir memories within us of a people we once were. 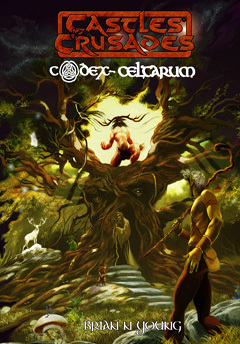 The Codex Celtarum delves into the myths of the Celtic peoples, the powers of the world around them, the monsters that hunted them, and the gods that watched over them. Its author, Brian Young, a scholar by trade, introduces the Celtic mythos like never before, exploring the depths of that world to recast it for the fantasy RPG Castles & Crusades. Within the Codex Celtarum lies a wealth of information; gaming material that blows new life into the world of the fey, the Druid, the ranger and all characters whose travels carry them through the wooded hills, broken crags and dark forests of our primeval imagings. With fey blood in your veins, you too can possess the powers of the fey, or even adopt new races for your game. The elder gods possessed powers of surpassing wonder and left a world with all manner of strange incarnations. Those are yours to bring to life. Codex Celtarum comes complete in seven glorious, fun filled, fact packed chapters. Chapter 1 covers a complete history of the Celtic world view. Chapter 2 delves into the world of fey. Chapter 3 presents races and monsters. Chapter 4 covers mountains of new spells and magical abilities. Chapter 5 tackles the lords of war. Chapter 6 looks at the gods themselves. Chapter 7 yields new material for the Castle Keeper.